Area of use: Ready for use. Ingredients: seaweed extract, water, salt, flavourings (contains crustaceans and molluscs), flavour enhancer: monosodium glutamate, food colouring: carmin, annatto, stabiliser: xanthan gum, antioxidant: citric acid, preservatives: potassium sorbate and sodium benzoate. The product is cholesterol free! Does not contain ASO food colouring. 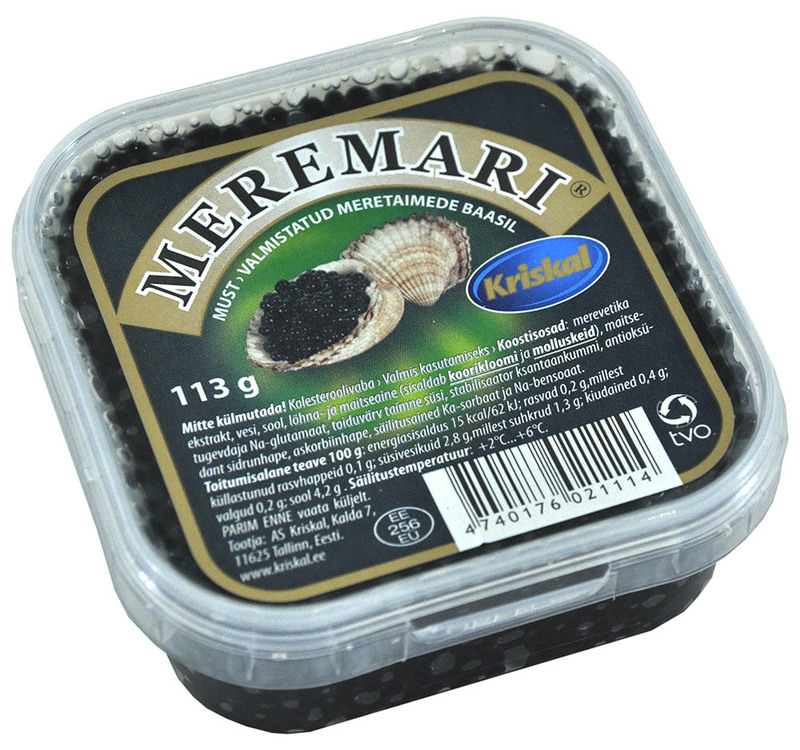 Recommended recipe: 1 box 113 g “Seaweed Caviar” finely chopped onion, green dill, and black pepper to taste. Mix and serve with toasted bread. 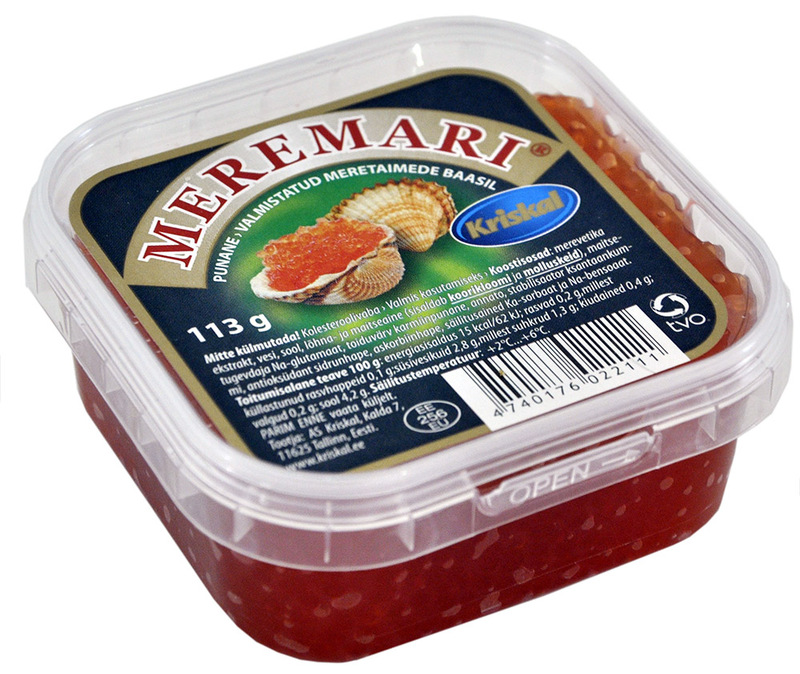 "Kriskal Caviar” is a product prepared using a gelatine base, to replace natural caviar. The caviar grains have a diameter of 2.5 - 3.2 mm. Ingredients: Fish bullion, gelatine, cooking oil, thickeners: guar gum and carrageenan, salt (max. 4.5%), flavourings (includes crustaceans and molluscs), vegetable carbon food colouring, antioxidants: citric acid and ascorbic acid, and preservatives: sodium benzoate and potassium sorbate. Nutritional information 100 g: energy content 79,7kcal/334,7 kJ; fats 2,9 g; carbohydrates 6,7 g; protein 6,7g. Ingredients: Fish bullion, gelatine, cooking oil, thickeners: guar gum and carrageenan, salt (max. 4.5%, flavourings (includes crustaceans and molluscs), carmin food colouring and riboflamiin, antioxidants: citric acid and ascorbic acid, preservatives: sodium benzoate and potassium sorbate. Ingredients: Fish bullion, gelatine, cooking oil, thickeners: guar gum and carrageenan, salt (max. 4.5%, flavourings (includes crustaceans and molluscs), vegetable carbon food colouring, antioxidants: citric acid and ascorbic acid, preservatives: sodium benzoate and potassium sorbate. 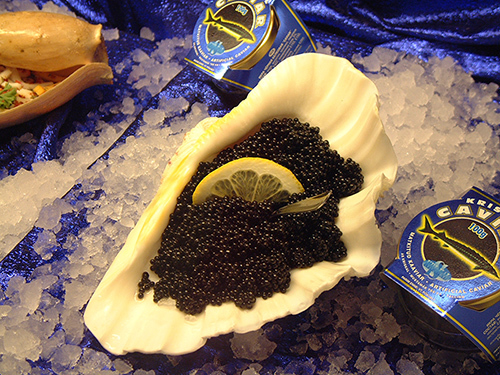 In connection with the decline in fish stocks, the availability of natural caviar has become difficult. 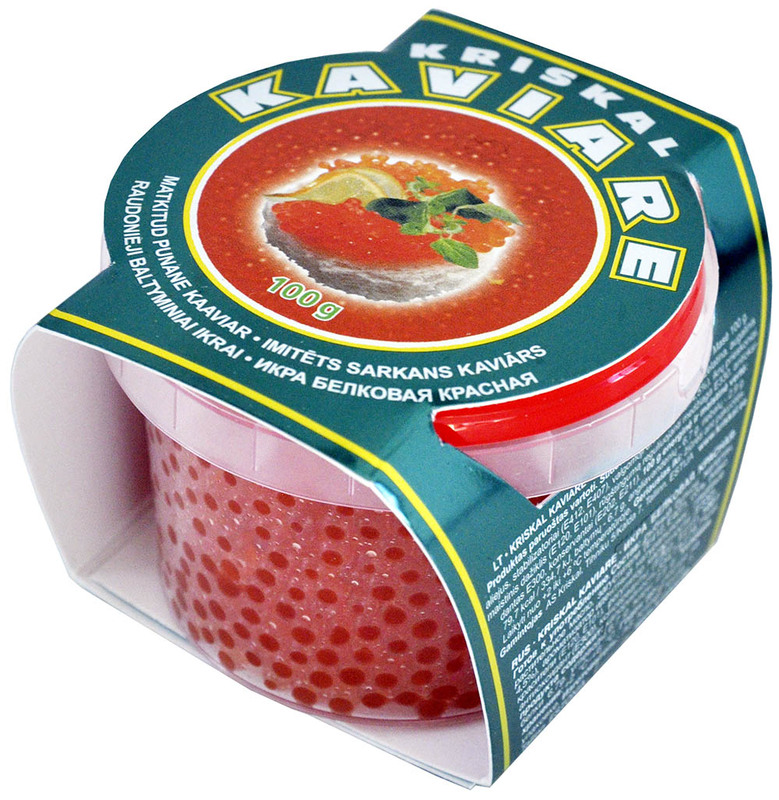 In order to satisfy the needs of consumers who love caviar, a product comparable to the original has been developed, which is prepared from seaweed, and to which salt, vitamin C and seasonings have been added. 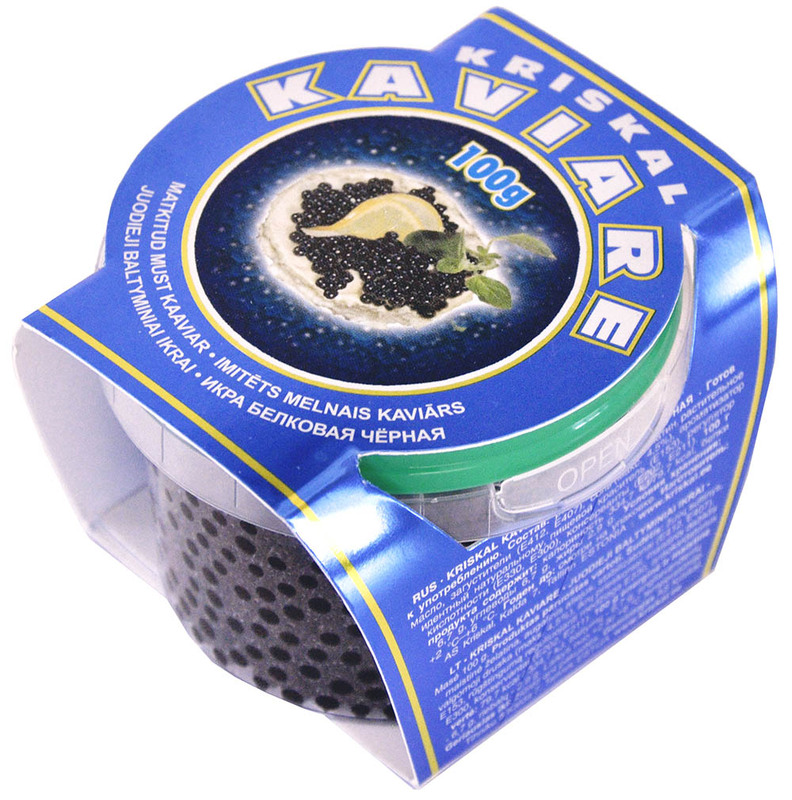 What makes “Seaweed Caviar” good? The product is cholesterol free! The seaweed contained in the product has the ability to bind radio nucleotides and heavy metal ions in the human body, regardless of where they are located, and remove them from the body. For example, strontium and caesium, which mostly collect in the bones, are removed almost entirely from the organism within 7-30 days and replaced with calcium. What are the bases for the claims that “Seaweed caviar” is beneficial for the human body? Specifically, in Japan and Ukraine, widespread research has been conducted by the Ministry of Health’s Hygiene Institute and the Pharmaceutical Committee’s State Medicinal Products Research Centre, in addition to analyses in the same field in other western countries.